I think it might be. I doubt we will have many more warm days this year. If the precipitation keeps up we might have snow before long, and lots of it. Wow!! Haven't been fishing lately and didn't realize the temps were getting to the magical numbers yet. Time to start beating on the bronze!! ... didn't realize the temps were getting to the magical numbers yet. Time to start beating on the bronze!! 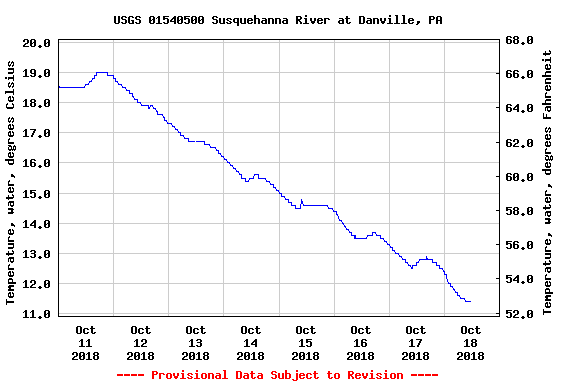 Them might be magical numbers...but a 14 degree drop (at Danville from 66F to 52F) in 7 days might just cause lockjaw...at least in some areas. Could use some stability for a week or so. Weather next week looks pretty stable. Rain chances are zero to 20%, water temp should stabilize even though on the cooler side. Hope this stability puts on the feed bag! I found that website but can't figure out how to get the water temp to display. Would you mind posting the link?